The four JPIC Captains this year from transition year are: Heloise Imbert, Abby Bowden, Beth McAllesse and Olwyn Mooney. Our first presentation of the Loreto JPIC seminar in Emmaus Retreat Centre Swords was a school presentation with the familiar faces of two Beaufort students in fifth year- Eve Conlon and Laura Candon who were two of the JPIC captains last year. They gave us a PowerPoint presentation about what their goals were for JPIC, how they set about to achieve their goals and what they did in school and in the community to help the Gobal South. The PowerPoint was extremely helpful and gave us many ideas on how our year could help to become more involved in JPIC and create effective awareness campaigns. The Beaufort presentation was followed by a talk about the work of Trócaire by Justin Kilcullen who is the director of Trócaire. Justin told us about some causes of poverty in the Global South: which were civil wars, climate (drought / sudden torrential rain) and tied aid from the Global North, Aids / HIV. Instead of giving the Developing World food aid, Trócaire introduced irrigation schemes to provide more water for farms, drought-resistant seeds and land work. We were told that Trócaire doesn’t believe in sending immediate or emergency aid but instead sends development aid which is long and hard to set up yet it leads to a more independent and efficient future for the developing world. Trócaire also worked on the Land Equity Movement of Uganda which stopped poor women and families being taken advantage of for their farms which they needed but First World countries wanted the crops to make palm oil fuel for cars from which they would make an enormous profit and almost none of the profit would go to the people from which they took the farm. Our next topic was about how to improve our language when talking about the Developing World and the Developed World and it was a presentation called Learning to Unlearn by Annette Honan. I found this talk very helpful as she showed us how to talk about problems in the Global South without us sounding as if we think that we are superior to people in need. She gave us phrases and words as an alternative approach when talking about different countries and aid such as “working alongside” rather than “helping” or “justice and fairness” instead of “aid”. After lunch we had a Trócaire workshop by Bríd Dunne who showed us the difference between solidarity and charity by getting us involved in different situations and we had to choose what we thought solidarity meant as a group and then we had to prove our point to her. 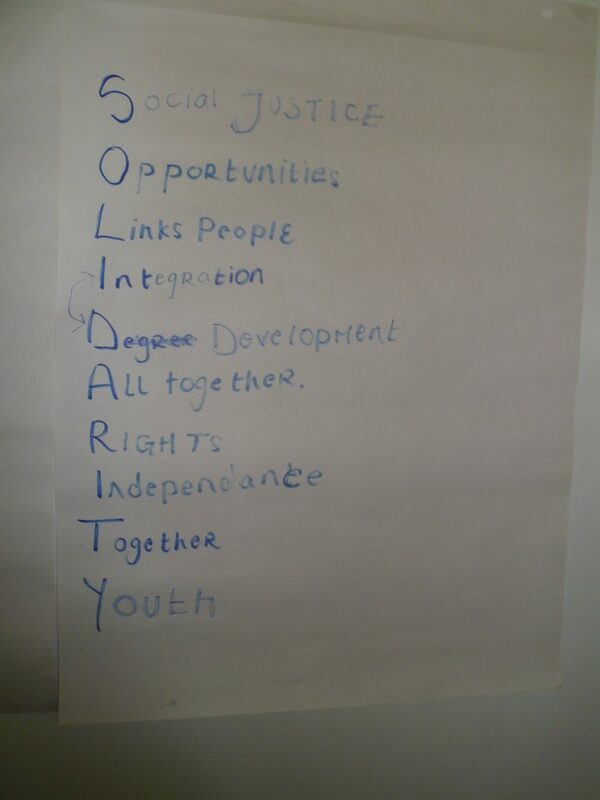 Next we had our Young Social Innovators seminar by Sharon Murray. This was one of my favourite talks as she gave us many fun ideas to raise awareness about topics. She also made us work as a team in various games which were all about teamwork and co-operating on the best way to solve the problem at hand. We also did an exercise about human rights during the YSI talk and were given different situations and we had to choose which rights they were being denied and why this was wrong. During the evening we had another PowerPoint presentation about Loreto International by Sr Louise O’Sullivan. We found Sr. Louise O’ Sullivan’s talk very inspiring and powerful as she had personal stories and images that she told us about when she was in Loreto schools around the globe. She told us about the work that her and her fellow .colleagues had done for the Loreto schools in Kenya and Kolkata such as building schools (primary and secondary), working in orphanages with sick children whose parents had either died or were extremely ill with aids, children who were victims of FGM and children who were abandoned at the orphanage by relatives who could no longer look after them. In the night we had a reflection led by Ms. Donohue which was about being thankful for our opportunity’s that we got in life and also leaving our sorrows and worries in stones that everyone got and when the reflection was over we left the stones around the JPIC cross and it was like we were leaving our worries behind. After a long days work we had our last cup of tea and socialised with other JPIC captains from all around Ireland and we got to know each other very well. The following day we had a very interesting seminar by Patsy Toland who is the Development Education Co-ordinator of Self-Help Africa. This was by far the best presentation as he showed us how our little day to day actions could reflect in the Developing world. He simply did this with talking about the contents of his shopping bag. We were informed that the brands Coca-Cola and Nestle were a big contributor to poverty in Developing countries as they just used the produce and didn’t pay the workers and in some cases they destroyed the surrounding habitat just to get an ingredient. The work of Self Help Africa is to bring the message of African futures to a wider audience. They also work with rural communities to help them improve their farms and livelihoods. This year the Justice and Peace Committee has been involved in many different activities and projects. At the beginning of the year two of our members, Sarah Burns and Mary-Méadhbh park, attended a Loreto conference on Justice and Peace in the world. They reported back about all the fun activities they took park in as well as the important facts they learned about the millennium development goals. We received talks from members of the 80:20 charity organisation as well as a very interesting talk from Michael Denny about promoting Justice and Peace in our schools. The Justice and Peace committee organised Beauforts AIDS Awareness Day on February 26th. 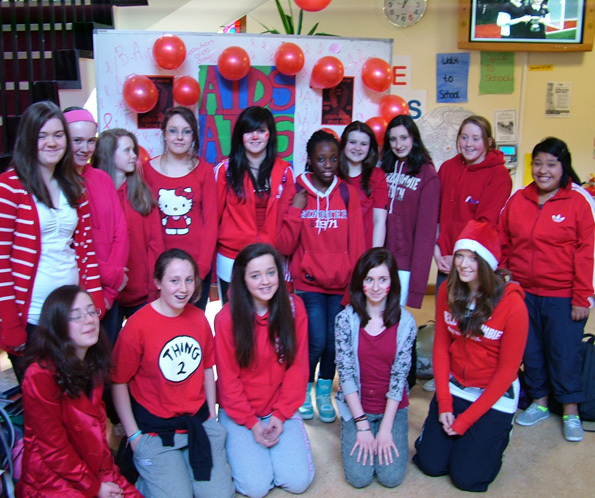 On this day pupils brought in 2euro and wore red clothing and nail polish. The school was decorated with posters designed by the 1st year students and the reception area had a large notice board filled with facts about AIDS and was surrounded by red balloons. The 2euro that was collected from the students went to the Slí Eíle charity and Loreto Matunda. The 1st and 4th year classes were presented with a powerpoint presentation on AIDS prepared by the committee to raise awareness on the issue. The day was a huge success and was enjoyed by all students! The winners of the 1st year poster competition were awarded a small prize. Early this year, 12 girls and 3 teachers from our school traveled to Africa with the Niall Mellon Township Trust to build houses. The entire school was presented with a powerpoint presentation about the trip. We learned alot about the poverty in Africa and how different their lives are in comparison to our own. While in Africa, the girls helped to build houses for the people in the community. They loved the experience and learned alot from it. Another member of our committee, Ciara Daly, started a Global Warming petition in our school to send to John Gormley who is the minister for the Environment to agree to make some substantial changes to lower Irelands carbon footprint. The petition was very successful, it was completed and sent out to John Gormley in December 2009. Other members of our committee are involved in the European Youth Parliament as well as the Model UN programmes. A group of 6th year students spoke in Rathfarnham Church about the Loreto Matunda project and raised money for the cause. The 2nd years have also been involved with the committee this year. Four 2nd years, Amy Feeghan, Emma Hiney, Niamh Mc Laughlin and Lauren Mellon have committed themselves to running the Womens Mini Marathon in aid of Slí Eíle. The 5th year JPIC committee supported all of the campaigns throughout the year, especially with the connection to Beaufort AIDS Day. They helped to raise awareness on the issue and to collect money from different class groups. The 5th year students who traveled to Kenya gave a brilliant power point to the school community about their trip. We in Beaufort were privileged enough to have Elizabeth, Daisy and Nancy come for a week here from our sister school in Kenya. They stayed with 2 of our classmates for the week and took part in our daily routine of our year’s timetable. They gladly held discussions and talks with all the other years in the school, and it is truly evident they made a big impression. It was beneficial for everyone to learn firsthand what a different life they have. The girls shared all their experiences which made our year more grateful. 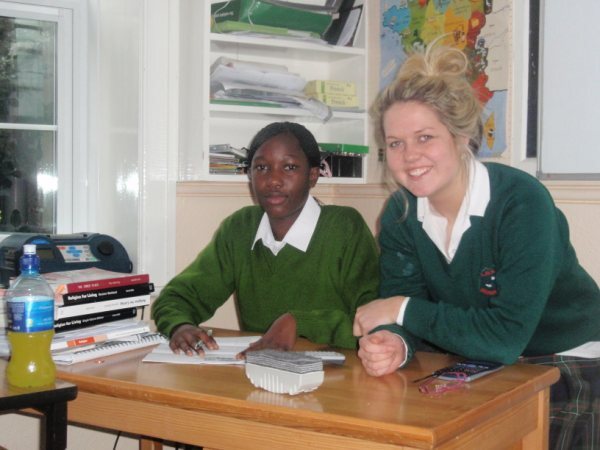 The 5th years hoped that the girl’s learned from us and got a lot more than they expected from their visit here. At the end of the week we wanted to give Nancy, Daisy and Elizabeth the farewell they deserved. All 5th years brought in some treats and sweets and threw the girls a party in the sun. The Kenyans girls said lovely speeches expressing how thankful they were while also showing us some of their dance moves! The girl’s had made a huge connection with our year and have been missed since they went home. It was a really beneficial experience to them but also to our entire school and we really enjoyed it! We first heard about Eco UNESCO in September when our school received a letter inviting transition year students to join a course about Sustainable Development. Not exactly sure what to expect, myself and a few other girls from the year applied for a place in this twelve week program. Myself and four other girls; Sadhbh Hegarty, Mary Maedhbh Park, Helen Sweeney and Laura Guihen successfully completed the twelve week course. We went along on the Wednesday to the Greenhouse on Andrew St for our first group session, and we loved it! 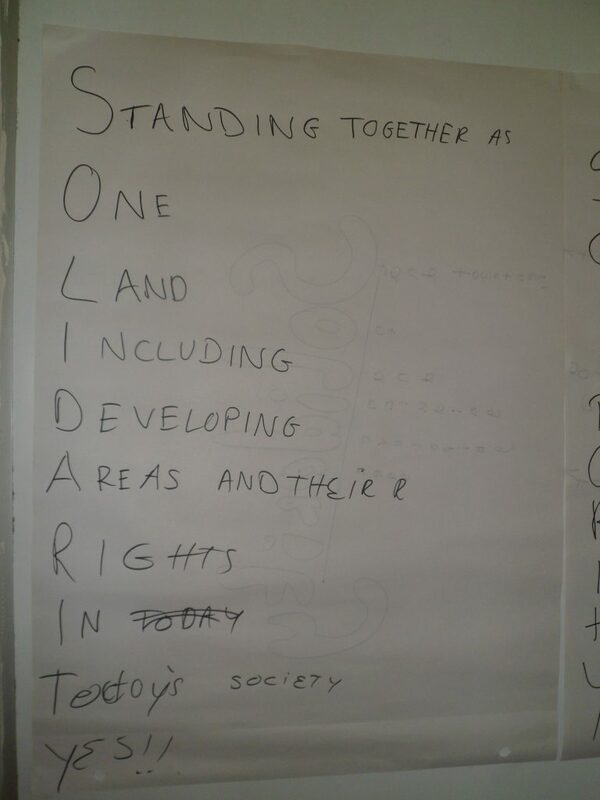 We first had to write a short essay on what we could bring to the session and how we were interested in sustainable development and green initiatives. After getting over that initial hurdle we were eager to begin saving the world one eco session at a time! We attended group sessions of about fifteen students on a Wednesday and Thursday afternoons from 5-7pm. These sessions dealt with a wide variety of issues effecting our climate and also our country as a whole. The main subject of discussion was sustainable development. 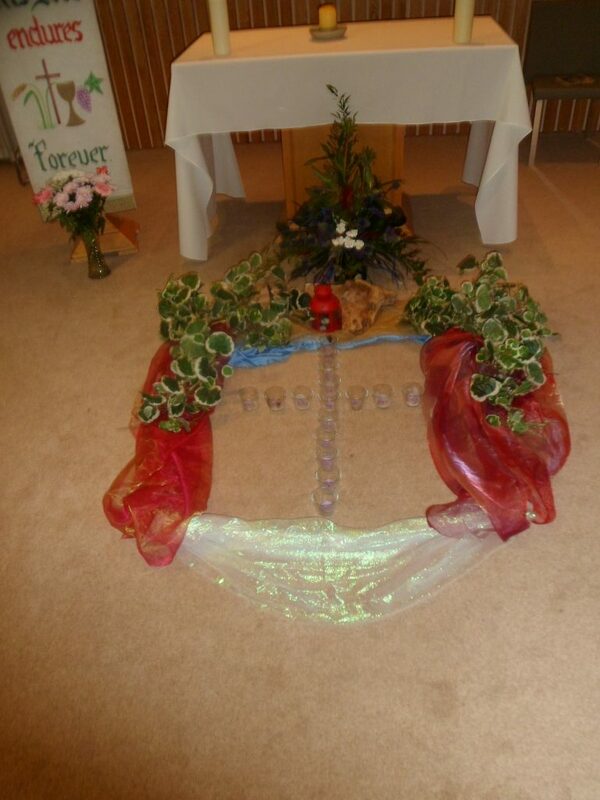 We had many interesting sessions that stretched a wide variety of activities and skills. Some of these sessions included a lesson in samba drumming, an action project training and a discussion on the role Sustainable Development plays in our lives today. Throughout the 12 week course we learnt a lot and participated in many action projects such as an environmental trip to Phoenix park, an Urban Safari and a wave protest. On the 5th December Eco unesco participated in a public wave demonstration in the city centre near the Dáil to protest for a our say in the upcoming Copenhagen Conference. We all We also attended the National Youth Eco forum in Croke Park where students from all over the country met to discuss initiatives that would be taken to the Copenhagen conference. We also recently interviewed John Gormley in Leinster House with questions related to the Copenhagen Conference. A very big task we undertook was planning our action project. We decided to hold an eco fashion show and concert in the Greenhouse which would promote issues of sustainable development to our peers. We hand-made all outfits out of recycled materials from old school socks to bottle caps! We also had a few bands playing at the gig along with the themed fashion show. The night was a huge success and we have been asked to perform our show again For the Young Environmentalist Awards in the Mansion House. After attending the twelve week course we are now qualified peer educators and will begin facilitating group sessions for the new class on our own next month!